The old freight tracks running past the old train station in downtown Azusa. Photo by Steve Hymon/Metro. 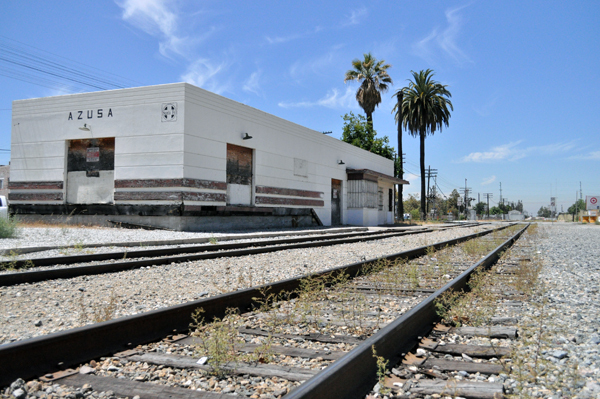 The Foothill Extension Gold Line between Pasadena and Azusa follows an old rail right-of-way presently owned by Burlington Northern Santa Fe. The agreement with the freight railroad means that BNSF will abandon their rights to use the right-of-way between Azusa and Irwindale — where tracks still exist — and share the rest of the alignment with the Gold Line. It’s a critical deal to allow construction of the Foothill Extension to go forward. The Foothill Extension is funded by Measure R, the sales tax increase approved by L.A. County voters in 2008. Monrovia, CA –Today, the Metro Gold Line Foothill Extension Construction Authority (Construction Authority) announced the execution of a critically-needed agreement between the Los Angeles County Metropolitan Transportation Authority (Metro) and BNSF Railway (BNSF) that will result in BNSF abandoning their rights to use the corridor between (roughly) the future Arcadia and Irwindale Stations along the Metro Gold Line Foothill Extension from Pasadena to Azusa. The agreement was completed just over one year following approval of full funding for the project in March 2010. Amendment of the shared-use agreement between the agencies was a critical path item for the Foothill Extension project. It was one of a number of conditions required of the Construction Authority in the Funding Agreement with Metro that needed to be satisfied before significant funds would be released for the project. The original shared-use agreement was executed in the early 1990s, when the then-Los Angeles County Transportation Commission (now Metro) purchased the right-of-way between Pasadena and Claremont from Atchison, Topeka and Santa Fe Railway (ATSF) as part of a multi-billion dollar county-wide right-of-way purchase. The initial agreement allowed ATSF right to continue use of the rail right-of-way with the understanding that sometime in the future it would be needed for a planned rail line. BNSF Railway inherited the agreement, after ATSF merged with the Burlington Northern Railroad to form BNSF Railway in 1996.